Seeing as we're Sunday today and tomorrow's Monday, I'm just squeaking in with a Mojo Monday 264 play along. 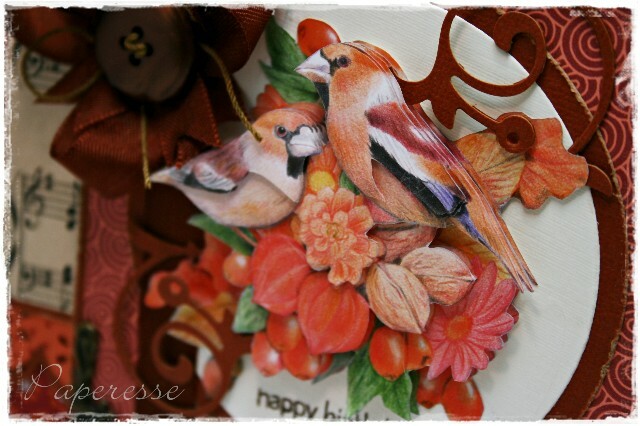 This birthday card with its center 3D bird image is just right for my mother's fall birthday. She likes birds and fall colors are her favorite – orange, rust, browns. 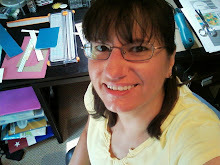 I had already decided on my paper color scheme when I saw this week's Mojo Monday card by Julee Tilman. As you can see, I was inspired by her work. I've had these metal corners a while and I hardly ever think to put them on a card. Her card reminded me that I had them and I think they look perfect here. I see more 3D images here in Europe than the States. We even have a card magazine devoted to 3D cards – Créatif Spécial Cartes 3D. I enjoy the process of using these 3D images as much as the outcome. I like cutting out the individual images. I challenge myself to see just how precisely I can cut. I think the Dutch must really like 3D images; it seems all the best 3D sheets are manufactured there. 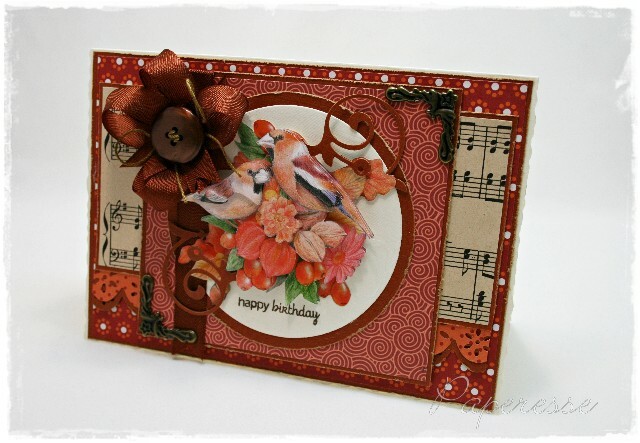 Paper – Folia Basics Red, Tim Holtz Kraft Core, Kars cardstock, Cardmaking and Papercrafting freebie, old sheet music. 3D sheet – Mireille Crafts. Stamp – Verve Happy Birthday. Dies – Sissix swirl, Artemio circles. Embellishments – metal daisy corners, button, ribbon, embroidery thread. Such rich colors and amazing detail! Cette carte est superbe ! Ce n'est pas évident la 3D car il faut être habile pour le découpage mais cela n'est pas un problème pour vous. Merci de votre visite sur mon blog. Amicalement.